Addressing one of the main contributors to climate change. AS WE WAKE up to the inevitable consequences of global warming and climate change, attention is at last being focused on the major causes of this impending catastrophe, which in the UK means transport, industry and buildings. In order for the UK Government to achieve its 20% reduction in CO2 emissions by 2010, industry, transport, building and domestic energy use all need to be placed under the microscope. The construction industry in particular is a major contributor to the UK’s energy use, and therefore to the production of greenhouse gases, accounting for over 50% of the nation’s energy use. There are two ways in which buildings use energy. One is embodied energy and the other operational or in use energy. Embodied energy covers all the energy expended in constructing the building, including quarrying, transporting and processing the raw materials and the activity of construction itself. Not only the main building medium of bricks or concrete, but plastics, PVC and steel all contribute to the embodied energy. However, this can pale into insignificance when compared with the ongoing use of energy by the occupants, calculated over the lifetime of the building: the operational energy. In a domestic building this includes heating, lighting, cooking, the use of labour-saving appliances, home entertainment and computers. In recent years new regulations, pioneering work by the Building Research Establishment and, more recently, the development of a single national Code for Sustainable Building Practice (CSBP), have been raising awareness of the need to conserve operational energy in buildings, particularly through the use of more efficient insulation and power generation. Although the CSBP is to be a voluntary code of practice, it is hoped that builders will be swift to comply with it as it will be considered a desirable mark of quality with the potential to improve marketability. With 200,000 additional homes planned for the South East, implementation of this Code cannot come a moment too soon. Conserving energy use in buildings can be achieved through the use of more efficient insulation and power generation. But, of course, more insulation can itself increase the embodied energy, because some forms of insulation expend large amounts of energy during the manufacturing process ­­– though the development of more natural insulation materials such as sheeps’ wool and recycled paper should, in time, ameliorate this. Victoria University in New Zealand has calculated the embodied energy of various insulation materials so that comparisons can be made, and these figures show that while fibreglass uses 269, and polstyrene 650 kWh/m3 to produce, sheeps’ wool takes only 39 kWh/m3. It is clearly important to consider the energy use of a building as a whole, including both its construction and its sustainability in the longer term; but this can lead to unexpected or awkward consequences. For example, a Devon barn conversion might have extremely low embodied energy because the building is either already standing or the materials are all on site and re-usable; but this low embodied energy will have little merit if the insulation is insufficient to ensure low operational energy. Conversions have to adhere to the same rules as new buildings, so levels of insulation and glazing are pre-determined. However, the barn walls, which can be as much as a metre thick, constitute a high thermal mass, which takes a long time to warm up but retains heat for far longer than an equivalent brick wall. This is ideal for a home in permanent use as the walls, once warm, retain their heat. Increasing the internal insulation, however, can render the walls into a low thermal mass, in which case the thick stone walls will not contribute to the insulation. The only way to preserve the advantages of the thick walls would be to insulate them on the outside; but to do this would lose the appearance of the original stone barn which was the reason the developer or purchaser wanted to convert the barn in the first place. Another conundrum arises with regard to old Victorian housing stock. Solid brick walls are poor insulators, and although it is possible to use thermal wallpapers on the inside or add a layer of masonry insulation to the outside, in general these buildings will remain wasteful of energy. A badly insulated Victorian house requires about five times the energy to heat as a new house; and building regulations have forced up the insulation of new buildings so much, even in recent years, that while a house built in 1975 might have an annual space heating demand of 36,400 kWh, this reduces to 7,100 kWh for a house built in 2002. As building regulations become stricter, so the energy efficiency of homes will increase further, raising the question as to whether it is better to pull down and re-build our inefficient older housing stock, rather than attempting to retrofit better energy efficient measures. With new houses it is easier to balance the relative merits of saving on embodied energy and keeping operational energy to a minimum without incurring massive additional building costs. 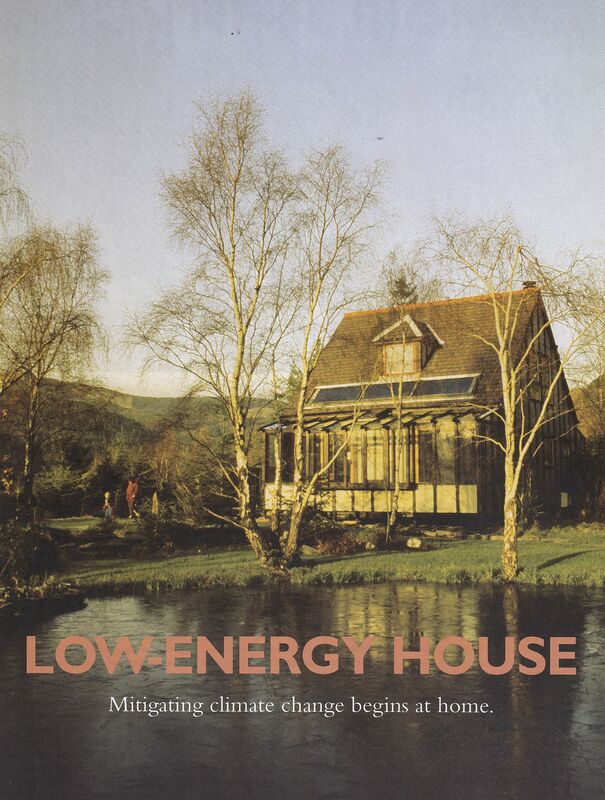 The Low Energy House built in 1976 at the Centre for Alternative Technology at Machynlleth, Wales, for instance, has 450 mm of rockwool insulation in roof, floor and walls, and quadruple-glazed windows. It takes only just over 1kW to keep warm – about a fifth of that used in a conventional house. With such low energy use, the embodied energy was cancelled out in a very short time, and the extra building cost was only about 10%. As we move towards more energy-efficient dwellings, limiting the embodied energy once more becomes the major concern. In recent years there have been experiments and developments both in lowering the embodied energy of new buildings and in minimising operational energy. Materials such as cob, straw bale, green oak and hemp can contribute to reducing both types of energy use; earth structures have opened up a whole new realm of sustainable design; clay and lime are increasingly used inside homes; Earthship constructions have been built from used tyres (of which the UK generates 40 million a year); and an understanding of passive solar gain has changed the way architects and developers design buildings. There have also been some exciting new buildings which aim to be carbon neutral, such as Zero Energy Developments. Some of our most famous architects are now incorporating significant environmental aspects into their designs, the best-known example probably being Bill Dunster’s BedZed development in Sutton, near London. Some of Dunster’s other designs have been rejected by planning authorities, and it is worth remembering that innovative design, even when it contributes to lower CO2 emissions, will not always be popular with neighbours, conservationists or councils. There may be other unpopular decisions that have to be made in the coming years. For example transport, another major contributor to CO2, impinges on how and where we construct our homes. In order to cut transport CO2 emissions we may find that urban development, as long as residents walk or rely on public transport rather than driving private cars, has the greatest potential for sustainable levels of energy use. This would have important repercussions for the planning and restoring of cities: but that is another story. The New Urbanism Movement in the US is addressing this by redesigning suburbs to become pedestrian and cyclist-friendly, for example by turning the huge six-lane highways that bisect communities into leafy boulevards with shops selling local produce, thereby reducing car need and food miles. The positive side of the huge contribution the building trade makes to our CO2 emissions is that by systematically cutting both embodied and operational energy use, the industry will be in a prime position to help us achieve our targets and move beyond those to a more sustainable future.